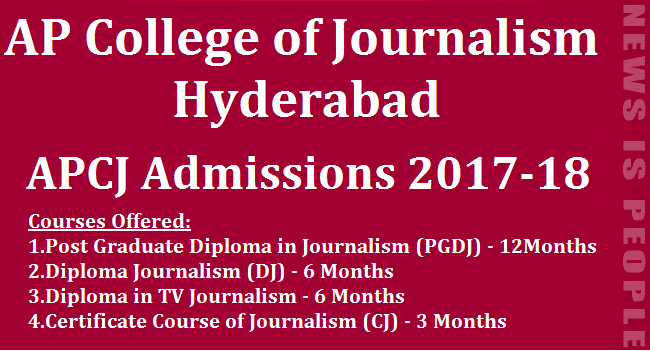 Those who seek admission into any one of these courses should either take Demand Draft(DD) for Rs.500/-drawn in favour of Director, A.P.College Of Journalism, Hyderabad in any bank and send it to The Director, A.P.College of Journalism, First Floor, Chabda Towers, SRT-42(Near Ashok Nagar Cross Roads), Jawahar Nagar, Hyderabad-500 020 by speed post or pay in cash in the same office to secure Application form and Prospectus. A P College of Journalism has been playing a significant role in providing skilled journalists to the ever growing needs of media in Andhra Pradesh. It was founded in the year 1997 by Mr.Satish Chandar, reputed journalist and poet in AP. Satish Chandar is also one of the founding editors of Vaartha newspaper and was the chief editor of Andhra Prabha. The college offers various courses to suit the interests of the candidates. The college is recognised by the Government of India. The syllabus of the courses is meticulously designed according to the needs of the media industry. The college runs a daily newspaper, PRAJA, which is specifically run for the students to give them a hands-on practical experience. A P College of Journalism boasts off a strong alumni. The students are placed in reputed newspapers and channels as journalists and reporters. Some of the students have a publication of their own.